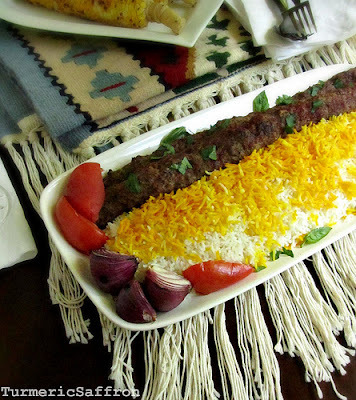 I just couldn't let my third summer of blogging pass by without posting a recipe for the internationally-known Iranian dish: kabab koobideh/kabob kubide. 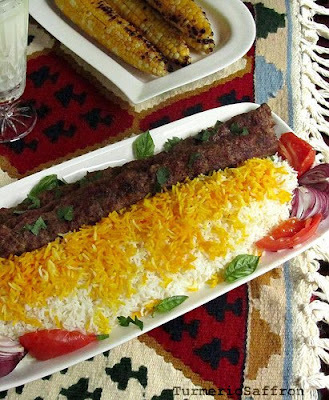 In addition to this popular kabab there's also the well known kabab barg (grilled skewered lamb tenderloin) and the delectable joojeh kabab (grilled chicken) as well as many other types of kababs, which are served with chelow, the parboiled and steamed rice. In our home, grilling has become one of the rituals and pleasures of the summer, but usually by mid-October the gas grill gets cleaned, covered and put away for the rest of the year until the trees bloom once again. On the other hand, growing up in Iran it was always grilling season! Kababs were made all year-round, regardless of the weather conditions. Our barbeque grill was an old, overused but sturdy rectangular manghal (portable charcoal grill) left in the far away corner of the yard year-round. But on kabab days, in a matter of minutes my mother would bring the manghal to the center of the yard, place some zoghal (wood charcoal) in it and start the fire. When the coals looked hot and glowing she would place the kabab skewers on the fire. 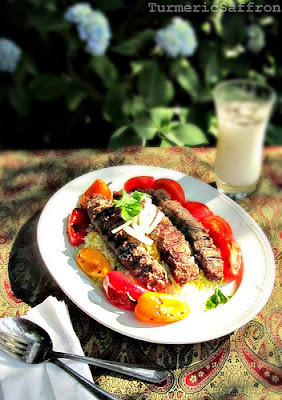 Kababs, like any other meal, were made solely by my mother from start to finish. She had the required ease and speed in preparing the meat, fanning the charcoal using a bad-bezan (straw hand fan) and at the same time frequently turning the skewers over so the meat wouldn't fall off. 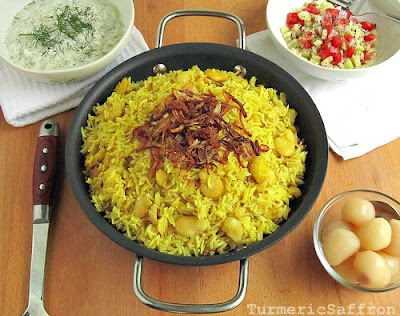 Then the cooked kababs and grilled tomatoes would be placed in between layers of fresh taftoon (flat bread) and immediately taken to the dining room table where the aromatic rice, small bowl of sumac, fresh basil leaves, quartered raw onions, yogurt and a pitcher of ice-cold doogh (yogurt drink) were already placed. Traditionally, کباب کوبیده koobideh is made with ground lamb. However, ground lean beef or a combination of the two could be used too. This is the kind of kabab that needs meat with some fat on it. 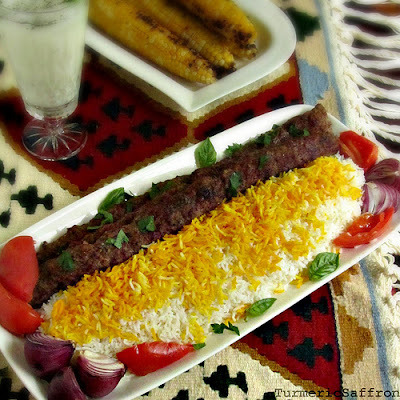 Koobideh is basically made with very few ingredients consisting of ground meat, grated onion, salt and pepper. Adding a teaspoon of sumac, turmeric, saffron or any other ingredient is totally optional and depends on one's individual tastes and preferences. I'm not a big fan of using (joosh-e shirin) baking soda in cooking but a few times I have taken my friend's advice and added a teaspoon of baking soda to tenderize the meat mixture and I liked the result. I like to buy the meat on the same day that I'm grilling but if you decide to do your shopping a day in advance it's better to prepare the mixture and keep it in the refrigerator. Kababs are always served with grilled tomatoes but grilling other vegetables such as onions, hot green peppers or corn are optional. Serving this dish with raw eggs on top, as was common in the past, is no longer advisable due to health reasons. In a large bowl combine all the ingredients and mix well with your hands until the mixture becomes well blended and sticky. Set aside at room temperature for at least an hour. Leave a bowl of water next to you on the counter for dipping your hands to prevent stickiness while placing the lamb on the skewers. You may divide the ground lamb into equal portions in advance or take a handful and shape into an oval and place on a flat and long metal skewer and press onto the skewer, making sure that both ends are sticking as well. 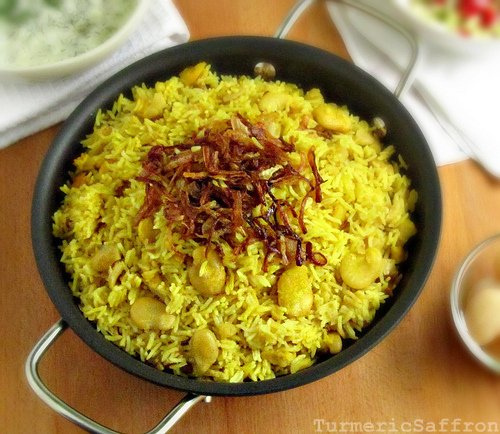 The thickness and the length of the kababs depend on your preferences. When all the skewers are done, set aside for at least half an hour. Turn on the gas grill and make sure it's very hot and then one by one place the skewers on the grill. Turn each skewer over quickly and continue to do so until the lamb is browned on both sides and well cooked. Place the vegetables directly on the hot grill or place them on the thin metal or wooden skewers and grill over the flame. 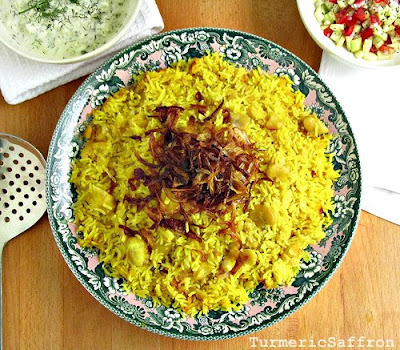 Set the table in advance, place all the necessary condiments you would need for the meal, serve the rice on a platter and then bring the kabab platter to the table with the grilled vegetables.